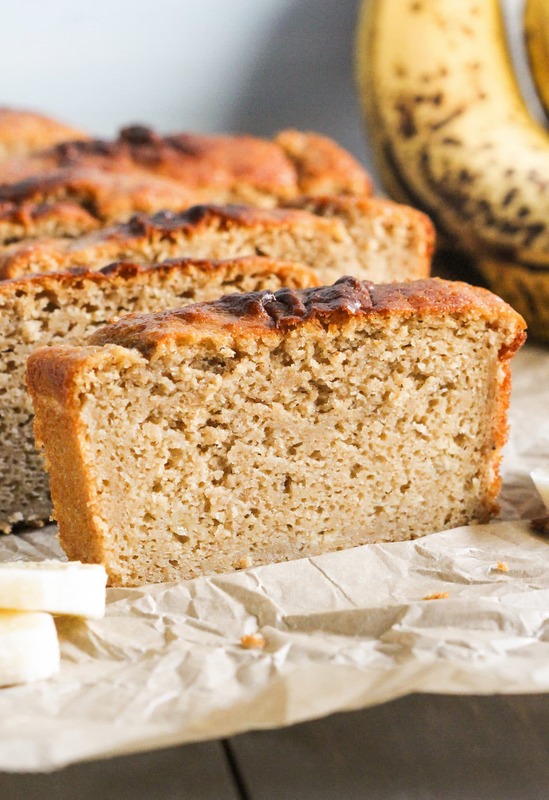 This Banana Bread Pound Cake is comfort in a slice with a hidden dose of healthy. Oh yeah, that’s right. This is a HEALTHY Banana Bread Pound Cake! After one bite you’d never believe me, but this incredibly moist, buttery, and sweet goodness is refined sugar free, low fat, high protein, and 100% whole grain. It seriously tastes like it’s from a bakery. It’s still hot here in Texas, but it’s just starting to drop out of the 90s and 100s. THANK THE LORD. Because it’s really no fun getting back into your sauna of a car after a quick 5-minute trip to the grocery store. Banana Bread has been, and always will be, my choice comfort food. But this Banana Bread Pound Cake is giving it a good run for its money. It’s just TOO. DAMN. GOOD! 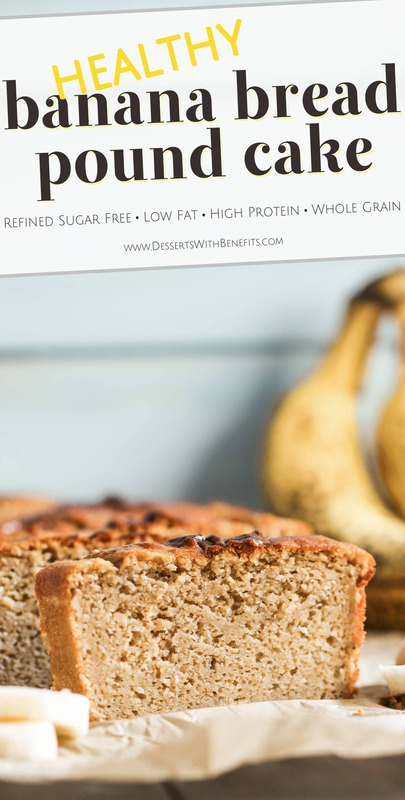 This HEALTHY Banana Bread Pound Cake is moist, buttery, and sweet cake is refined sugar free, low fat, high protein, and 100% whole grain! A thick slice has just 190 calories and 5g of fat, plus 8g of protein and 3g of fiber, with no butter or white sugar in sight! Preheat the oven to 350 degrees Fahrenheit and spray an 8x4" loaf pan with cooking spray. In a small bowl, whisk together the whole wheat pastry flour, protein powder, cinnamon, baking powder, baking soda, and salt. To the bananas, add the eggs, yogurt, maple syrup, oil, erythritol, stevia extract, vanilla paste, and butter flavor. Whisk until completely combined. Dump the dry ingredients over the wet ingredients and fold together until everything is incorporated. Pour batter into the prepared pan and bake for ~40 minutes, or until the surface browns and springs back when tapped. Let cool in the pan for 30 minutes then transfer to a wire cooling rack to cool completely. Slice and serve! 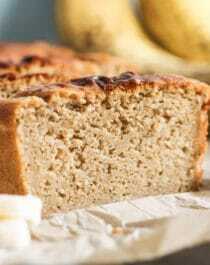 Yes, a thick slice of this Healthy Banana Bread Pound Cake has only 190 calories and 5g of fat (just a fraction of typical storebought or homemade pound cakes). Plus, 8g of protein and 3g of fiber, with no butter or white sugar in sight! Yeah, you can enjoy TWO slices of this Healthy Banana Bread Pound Cake and still have less calories than a single slice of Starbucks banana bread. A guilt free treat? Totally. I have some questions about this recipe: Could it be made vegan? But I would like it to stay as low fat as possible and high protein – I suppose I could use vegan protein powder, soy yoghurt but I don’t know about the egg whites. It’s almost pure protein and I’m thinking of a replacement made of liquid and protein powder, but I would like to know a professional’s cook opinion. By the way, is it possible to use applesauce instead of the oil? Or do you think it would be too dry? I’m sure this recipe can be made vegan, but I honestly don’t know how. This cake took four trials to perfect, so I’m hesitant to give any substitution recommendations. However, if you would like to make the recipe vegan I would use soy protein powder, soy yogurt and Ener-G egg replacer. You can try the applesauce too, in my experience, applesauce is a great oil replacement. I hear ya sister, I absolutely hate the weather getting cold. This looks delicious! I am OBSESSED WITH bANANA bread! I have over 7 recipes for it on my blog! Banana bread is great, but I’d love to see some seasonal foods with apple or pumpkin, or maybe a healthy version of a popular Halloween candy. Hi! I’m just getting back into cooking and baking. I love banana bread, but it’s hard to find a good gluten-free recipe. Could I substitute the whole wheat pastry flour in this recipe for gluten-free all purpose baking flour? Good luck, hope you love the recipe! Can the protein powder be omitted in this recipe? Could I add pumpkin purée to this? Mmmm that sounds delicious! I haven’t tried that before but now I want to. I wouldn’t recommend adding pumpkin to the recipe, but maybe you can substitute some of the banana with it. Maybe try 1 cup of mashed banana + 3/4 cup of pumpkin puree. I find that bananas add more moisture to cakes than pumpkin, so I’m not sure about replacing ALL of the banana with pumpkin… however, if you’re up for some recipe-testing, feel free to give it a shot! BANANA BREAD POUND CAKE. Our dreams in a bread! Your blog is beautiful. Love the food styling and recipes look healthy. I’ll definitely be consulting your recipes for retreat work. Great work!! Sounds like a delish mashup! It’s been in the low 90s and high 80s where I am in San Luis Obispo, but in all seriousness, I am getting ready for the fall weather myself! It’s the first day I’ve worn my sweatpants and my fall yarn sweater, which is an amazing sign! Anyways, this banana bread pound cake looks sooooo fluffy and delicious. I will have to replace the whey protein, yogurt, and eggs for vegan alternatives, but I think that everything will turn out well–hopefully! WHOOP WHOOP! I love the “first-day-of-sweatpants” season! This looks absolutely DELICIOUS!! I have about 8 over-ripe bananas on my counter that need to be frozen for smoothies or turned into this bread!! How much is a serving is it 6 ounces? this looks so yum! but I need vegan options as well. have you heard back from anyone who attempted those substitutes?? It’s in the oven now, it has been there for 50 minutes and is still raw in the center while the edges are perfect. It’s sad because by the time the center is cooked the borders will be dry. I love banana cakes but I never get to make any that turns out good, they are always tooooo moist, like raw. Did you make any ingredient substitutions, and did you make sure to weigh out your ingredients? Also, are you using an oven thermometer to make sure your oven temp is correct? Does the protein in this, have to be specifically Whey? I have a few different kinds, one including vanilla (by Ensure). I just want to make sure. Please let me know. Thank you!